This morning, I woke to a wonderful number of alerts stating the people who had pledged money in advance of the Crowdfund we are launching so we can open The Business Cafe in locations across the UK (and beyond). As I boiled my kettle, my thoughts were about the progress we are making and the generosity and belief of those who pledge, then deeper than that, was the fact that so many people in the community here are ‘packing my parachute’, everyday, in so many ways. They are also packing yours. Many of us run communities, our drive to build communities and be part of one is not a new one, many of us have wanted to build families, love and community around us all our lives, the power of belonging and being part of a large group of people that share, give skills and unconditionally support – even love, one another is the most powerful force on earth. It is also the oldest. Being an active part of a community is a privilege, it is also full of reciprocity, we give and we receive, communities cannot work if the balance of asking for help and giving help is not equal. The gains are in equal measure, when I give, I feel as good as when I receive; my self esteem, worth and social capital increases. The engagement within this group as a proportion of members is the highest I have ever witnessed. It is clear that we have a very mature, skilled group of community citizens in these walls. I am so grateful for this; I gain inspiration, ideas, skills and a huge amount of emotional support when I enter this community. Thank you. 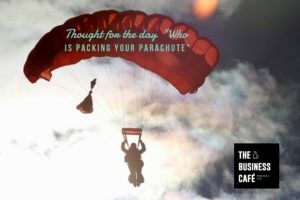 So, why the title ‘who is packing your parachute, and whose are you packing’? Years ago I heard this story, and I have retold it many, many times, I want you to have it in your life too, share it, it is so powerful. You can lift more about it if you search ‘Captain Plumb, who packs your parachute’. This is a true story of a Charlie Plumb, a U.S. Navy jet pilot who served in Vietnam. Charlie flew 74 consecutive successful combat missions. However, on his 75th mission, his F4 Phantom fighter plane was shot down by a surface-to-air missile. Captain Plumb was forced to eject. The only thing between him and imminent death was his parachute that he prayed would open. Years later he was sitting in a restaurant, a man across the room from him kept on staring at him and eventually went up to him and asked if he was Captain Plumb. Establishing he was, he then revealed that he was the man who packed Captain Charlie Plumb’s parachute. That night Charlie was lying in bed and thought to himself about all the times he had walked past the ‘parachute packers’ on the aircraft carrier and ignored these people, yet, these were the very people that saved his life. I love this story, it says so much between its words. We are now the most connected we have ever been in history, the likes, the loves, the comments, the RT’s and the offering of tips and skills that each of us do, in every moment that we open Facebook, share on twitter, click the heart on Instagram, comment and give encouragement, these are moments when we pack someone’s parachute, and those people are packing ours when we receive it. It is so easy to do, and I guess the parachute packers had days when they forgot the reality of their role in the war, however, we should never stop appreciating the small acts that add up to the huge life saving moments when we feel ‘I belong, people listen to me, people value me, I matter’. Building a community is not about the person that opens the door each day, it is about the people that come in and talk, share, support and care for one another. So, today, my thought is 100% about all of you, thank you for packing my parachute each day and I hope I can pack yours in as many ways as I can.